The last couple days have been eye opening as well as reminders as to why I have embarked on this project www.openingoureyes.net. Maybe I needed a reminder at this point in my life that you only go around once and to make the most of it. And after spending a couple days with Ronni Kahn, CEO of Oz Harvest, I got that reminder and it affirmed in my mind why I took a risk, took on a personal project and took off for 3 months on a journey with my daughter around the world. But Ronni reminded me how important it is that you really only have the “now” in your life because you don’t know what tomorrow may bring. I remember when I first embraced the notion of living in the “now”. I was 19 years old and hitchhiking around the world. I remember a consistent remark from people who stopped to pick me up and bring me a bit further along on my journey. Many of them said, “I wish I had done what you’re doing when I was your age”. I never lost sight of that and have always lived my life with the thought that if I don’t do “it“ now, I may never get the chance again. No one really knows what tomorrow will bring – that’s the mystery of life. The best-laid plans are never givens and the surprises and unexpected moments are many times the most rewarding. Tonight, I had a simple yet memorable dinner with my 23-year-old daughter Erin. 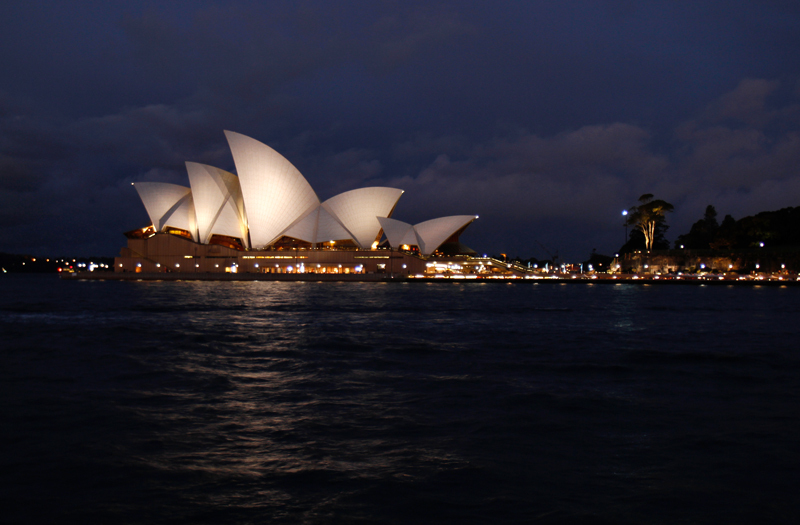 As we ate our pizza and had a lovely, inexpensive bottle of wine – we took notice that here we were in Sydney, Australia, overlooking the Sydney Opera House and it all seemed so surreal. But it was real, it a moment in time that we made happen, that we didn’t postpone until the “perfect” time in the future and a time that we will always have and always remember. We were living in the “now” moment. Love following along with you guys as you traverse the globe! I just can’t wait to see the culmination of all your hard work. It’s going to be such an inspiring film! Tomorrow I want to put together a slideshow for the kids of photos that our friends have taken – some that Karen sent, some that we’ve taken, and maybe a few from your blog? All the best – take care!